Despite its proximity just across the Baltic Sea, Sweden is right at the other end of the healthy life year scale with Swedes enjoying around two decades of extra healthy living. "The EU country with the highest number of healthy life years in 2016 for both women and men was Sweden (73.3 years for women, 73.0 for men). In contrast, Latvia had the lowest number of healthy life years for women (54.9 years) and men (52.3 years)." However, in one small crumb of comfort, Eurostat added that differing methodologies may account for some of the huge gulf, saying: "Extreme values can partly be explained by the way in which activity limitation is measured in the country, impacting, to some extent, on the results." The data for Latvia further suggests that between 2010 and 2016, the number of healthy life years Latvians can expect from the age of 65 actually decreased, for both males and females. "Whether extra years of life gained through increased longevity are spent in good or bad health is a crucial question. Since life expectancy at birth is not able to fully answer this question, indicators of health expectancies, such as healthy life years (also called disability-free life expectancy) have been developed. These focus on the quality of life spent in a healthy state, rather than the quantity of life, as measured by life expectancy. Healthy life years are an important measure of the relative health of populations in the European Union (EU)." 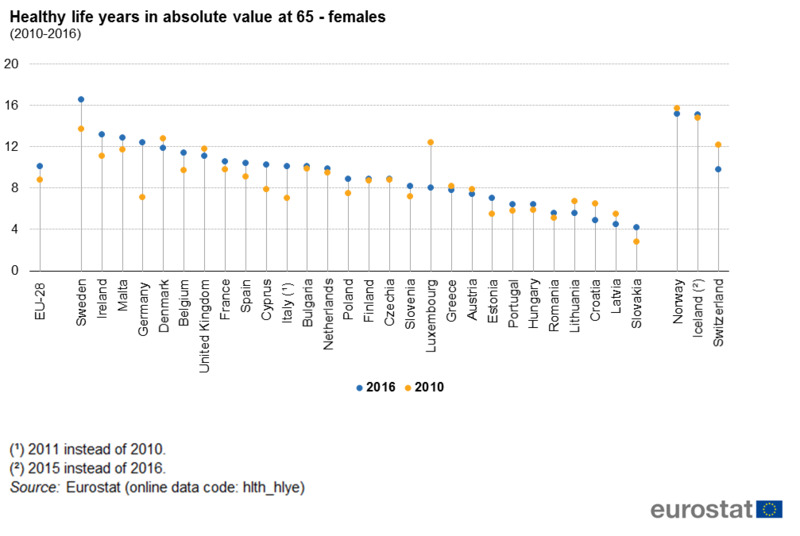 You can examine the full data set at the Eurostat website.